Mobile operations via mobile devices provide faster reaction and easier management of activities. However, a mobile device increases the work for IT for support and maintenance, and also introduces more challenges of supervision and security e.g. risk of loss or theft, or misuse. 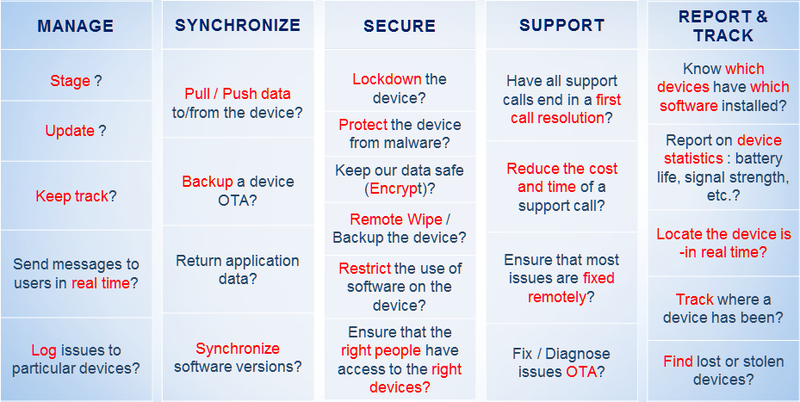 A mobile management solution is required to address 5 key aspects of device management. We offer the award winnin , proven, affordable and feature rich Mobi Connect solution. The adoption of mobile devices in business is growing exponentiall . BYOD or ‘bring your own device’ is now the norm for many industries i.e. work across platforms and devices. Reduce IT’s workload and increase their effectiveness remote management, deployment of patches and isntalls etc. Track who and who is not logged on, and their location.